Modern, Minimal, Feminine or Classic? WHAT’S YOUR FAVORITE FALL STYLE? Many styles are already going fast, so stop by soon, instore or online at resouL.com. We wouldn’t want you to miss out! Since my first day at re-souL I have had a soft spot in my heart for MOMA. They’ve been the ones that always catch my eye and tempt me the most. From the way the leathers crease and fold, reminiscent of the topography of a map to the little marks and quirks of the hide that make each boot both unique and familiar. This is why I like MOMA and why I am currently coveting their 50404 lace-up boot. Another aspect of the 50404 boot that has me coming back to it again and again is the look. This boot is incredibly fashionable with just a touch of grit. I’ve always loved dressing well but I hate being too dolled up. I like to throw in something rough or different with an outfit. 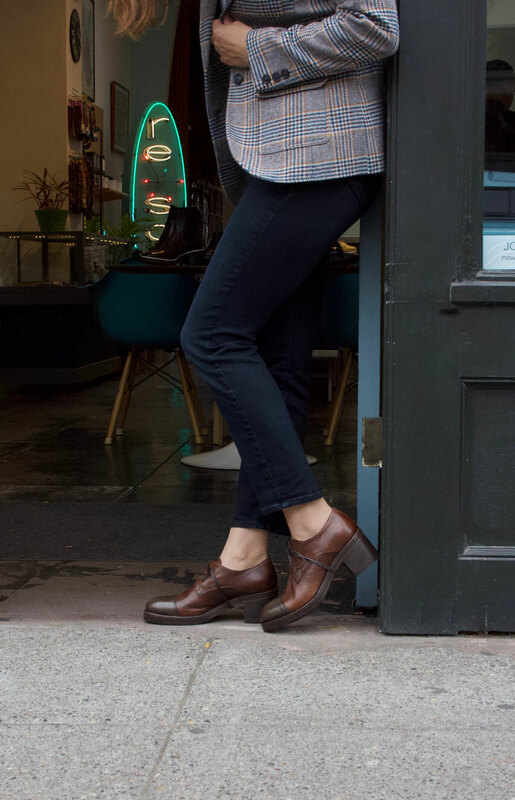 The 50404 boot allows me to throw in that military blue collar look while still maintaining a put together appearance. Alternatively, I can wear them with a tee and blue jeans and have an effortless, stylish casual look. Joe Cool has his sunglasses and I have my boots. Moma has always come across as more than just a shoe, it was clearly evident that the folks behind this brand had much more than shoes in mind when they develop their new styles for each season. These aren’t unskilled laborers sitting at an assembly line cranking out the same shoe or boot over and over again. These are artists; real craftsmen and women who are imbuing such an ordinary everyday thing with life and personality. For that, the knowledge that these boots are made with love and that they are going to be with me for years to come, that’s the real reason why I covet the MOMA 50404 lace-up boot.. This post part of a series of re-souL staff picks titled “Currently Coveting”. Many styles are already going fast, so stop by soon, we wouldn’t want you to miss out.